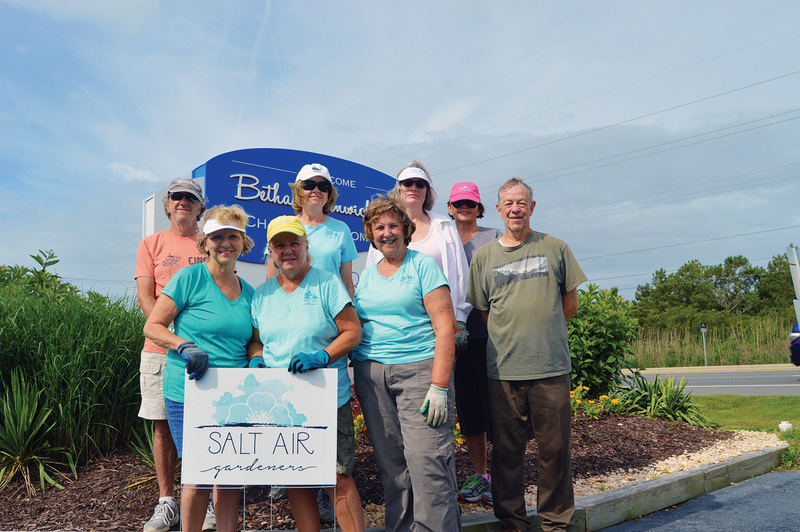 Members of the Salt Air Gardeners gather in front of the Bethany-Fenwick Area Chamber of Commerce where they worked to refresh the landscaping and infuse it with more native plants on Wednesday, June 27. On Wednesday, June 27, however, a different type of activity surrounded the Chamber grounds, as members of the Salt Air Gardeners worked to trim and refresh the plantings and remove weeds on the property. Susie Miller, the Chamber’s tourism information manager, said she had contacted the Salt Air Gardeners after seeing their work at the Indian River Life Saving Station. “We’re trying to be a showcase to visitors, so they can see how to do native gardens,” Miller said. Project co-chair Ginny Seaman said the Chamber gardens had a good base but had gotten “a little bit overgrown” over the years. The focus of the project, Seaman said, will be freshening up the beds around the building and adding more native plants to the ones already there. “It will be a multi-year, phased project,” Seaman said, with the initial work being done along the front of the building. The project is being jointly funded by the Salt Air Gardeners and the Chamber. Inland Bays Garden Center is supplying most of the plants for the project “at a good discount,” Seaman said. While the gardeners weeded out and trimmed some of the plantings, including yucca and prickly pear, they added such varieties as blue flag iris, butterfly weed, red twig dogwood, ninebark, rose mallow and a particular hardy, butterfly-attracting perennial called gaura. In addition to focusing on native species, the group is focusing on plants that attract butterflies. “The nice thing is that there is such a movement toward native plants that there are lots of cultivars available that can be used for landscaping purposes,” Seaman said. While the Chamber project is similar in some ways to the group’s work at the Indian River Life Saving Station, there are differences in the site and in the soil, Seaman said. So “it’s a little bit of an experiment to see what works” on the Chamber property, she said. Two advantages to the Chamber site are that the soil is less sandy and the gardens are irrigated. Project co-chair Louise Egan said the club, based in the Bay Forest community near Ocean View, is also making plans to work with residents of Brandywine Assisting Living on a garden project at the West Fenwick location, and is currently working with the Barbara K. Brooks Transition Home, a residential facility for female recovering addicts. “The women wanted a fruit-and-vegetable garden,” so the group helped them create a garden on the property and teach them how to maintain it, Egan said. “We like to work in the community,” she said. While the Salt Air Gardeners began as a group interested in creating a potting shed and an herb garden in Bay Forest, Seaman said it is beginning to attract members from outside Bay Forest. For more information on the Salt Air Gardeners, visit the club’s website at www.saltairgardeners.com or contact the club by email at saltairgardeners@gmail.com.